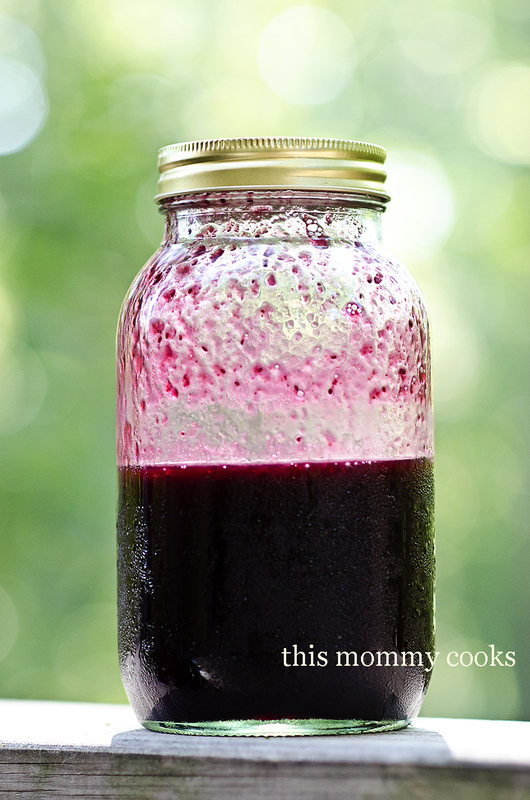 Oh, blueberry syrup, where have you been all my life? Way back when I bought all those blueberries, I made some syrup. This stuff is so good! You can put it on anything! I chose to pour it on top of my banana blueberry pancakes. Oh my word, so good! Using a sharp paring knife, peel three or four strips of lemon peel from the lemon. Try not leave too much of the white part on it. Then juice the lemon, and set both zest and juice aside. Remove pot from heat and scoop berries into a fine sieve or mesh strainer set over a heat-proof bowl or measuring cup. Using the back of a smaller ladle, press on the berry solids to extract as much juice as possible. Discard solids. Wash out your pot, then add the remaining 2 cups of water, lemon peel, and the sugar. Bring to a boil and boil rapidly for about 15 minutes until the mixture thickens. Add blueberry juice and 2 tablespoons lemon juice and stir to combine. Boil another minute or two. Remove from heat and allow to cool. Remove lemon zest. Using a funnel, pour syrup into clean jars. Top with lid and store in the refrigerator for up to six months.